Made this tree skirt from Done Over Decor via Pinterest. This little lovely is 100% no sew! I used my osnaburg fabric (instead of Burlap like the pin) and some red taffeta that I found on clearance at JoAnn's and cut them into 3" strips. I used some grey fabric I got from the thrift store to make the base to glue everything to. Then I used a ton of hot glue (need to buy more sticks after this project!) and glues the strips on in pleats. And I put our tree & skirt on a box cause it wasn't tall enough, looked way funny without a little boost. My tree skirt didn't completely cover the ugly box so I glued an extra strip of fabric straight to the box. 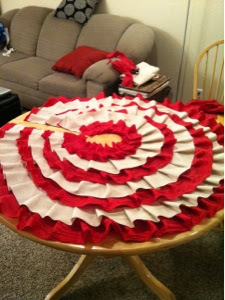 I used my table as a rough pattern - eyeballing it it looked like about the size I'd want for a tree skirt. And I figured it'd make the project a whole lot easier if I could fit the whole project on my table so I wouldn't have to have Stella 'help' me. I got these beautiful bulbs (bought them...my DIY soul is dying. I keep telling myself that I'll make some next year). Got this W last year on clearance - awesome that I knew that this year I'd be a Wright a no longer a Bankhead. I love the star on top of the tree - I grew up with a star and will always have a star. What do you put as your tree topper? Got this one from Target for $5, always got to love when the item you love the most is a great price. Afterwards I started brainstorming how to make a star, but I pulled in the reigns and had to stop somewhere on my Christmas crafts & Christmas parties! And I need to leave stuff to do next year! Beautiful tree, my dear! I need to make one of those tree skirts. Ours still has the ugly green stand. Thanks Stefani - at least your green stand looks better than my target box :). This one was so easy - a little time intensive, but still way easy! It's PERFECT!! Gosh I want my tree now! !